Sticky, sweet caramelised onions paired with tangy mustard and sharp cheddar make this mammoth melt a delicious take on a deli classic. 1 To make caramelised onion, heat veg oil in a pan and add sliced onion. Season with salt & pepper, and cook on low for 30 - 40 mins until onions reacha jam-like consistency. Transfer to a bowl and reserve. 2 Preheat oven to 180C. Heat 1 tbsp of butter in a skillet. Toast each side of one sourdough slice in skillet and reserve. 3 Mix tuna, Hellmann’s mayo & lemon in a bowl and season with salt & pepper. 4 Take one untoasted slice of sourdough, spread with Hellmann’s mustard and top with half the caramelised onions followed by half the tuna and three slices of cheddar. Take the pre toasted slice of sourdough and place it on top. 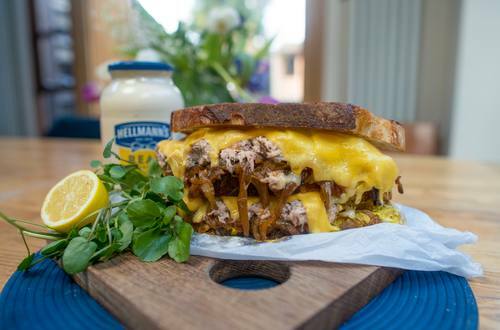 Spread with Hellmann’s mustard and top with the rest of the caramelised onions, the remaining tuna and the final three slices of cheddar. Place final slice on top. 5 Heat 1 tbsp of butter in the skillet over a medium heat. Place the sandwich in the pan and cook until bottom slice is golden brown. Place final tbsp of butter in the pan and carefully flip the sandwich over. Toast for 2 mins and then place skillet in the pre-heated oven. 6 Oven cook for 15 minutes until cheese has melted and sandwich is hot throughout.